Welcome to the Acadiana Courier Tux & Limo blog! We plan on using this space to share helpful information about our tux rentals and limousine service, as well as tips for how to make your next special event one to remember. But before we dive right in to why limo and party bus rentals are a must for weddings, prom, business events, and bachelor and bachelorette parties, here is a little bit more about us. As the premiere tux rental and limo service in Lafayette, we take great pride in what we do and love making special events throughout the Cajun Country of Louisiana even more magical. From escorting high schoolers to their senior prom in a party bus to helping grooms pick out the perfect wedding tuxedo, we do it all — and we love it. There is nothing quite like helping others create a perfect night they’ll never forget, and we believe that everyone deserves to feel special on these occasions. Acadiana Courier Tux & Limo has long been the one-stop-shop for tux rentals, party buses, and limousine services in the area, and many locals and visitors alike have come to us for their special event needs. We have suited up many high schoolers with the perfect prom tuxedo and party bus or prom limo in the past, making sure that we keep them happy, entertained, and safe during one of the best and monumental nights of their lives. To us, this is just as important as providing exceptional tuxedos, limousines, and limo drivers for weddings, black tie events, important business meetings, funerals, and every other limo service we provide. For us, no special event is more or less important than the rest, and we treat each and every one of the parties we serve with unparalleled customer service. Whether you are booking a party bus rental for your bachelorette party or are looking for the perfect white wedding bus or limo, you can count on us to be there early to pick you up, have the vehicle stocked with luxury amenities, and wait at the front to pick you up for a fun, safe ride home. 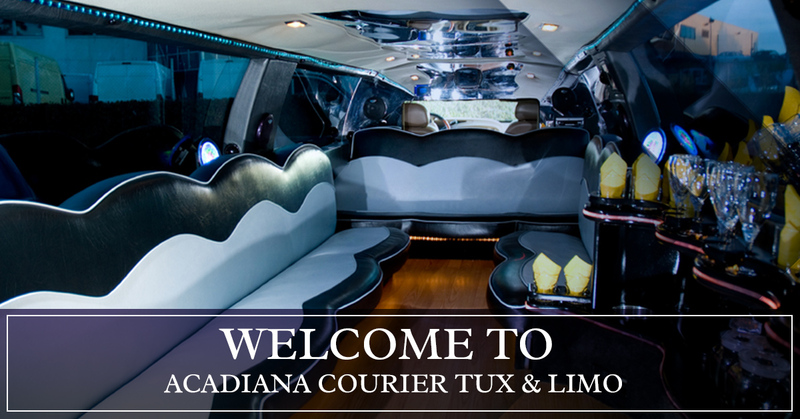 At Acadiana Courier Tux & Limo, party buses and limousine services aren’t all we do. We also offer unique alternatives like vintage wedding limo trolleys, limo busses, and more. Going to an upscale cocktail party at the country club? Arrive in style in a Chrysler limousine. Having the old-style Southern wedding of your dreams out on the rolling hills of wildflowers? A wedding limo trolley adds the perfect touch. Whatever it is that you need, we’ve got you covered! Since we are known for our fleet of luxury limos and glamorous party buses, some people forget that we also have a shop in Lafayette filled with a wide variety of wedding and prom tuxedos. Stop by Acadiana Courier Tux & Limo today, or contact us for more information. We can’t wait to suit you up with a fancy tux and limo service for your upcoming event!